Against a backdrop of religious extremism and bigotry, three young men are thrown together and forced to examine their values and attitudes. They all soon realise that if you don't or can't speak for yourself, you could soon be isloated. The trouble is, if you let others speak for you, can you trust them to get it right? 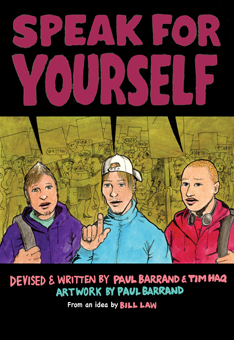 Immigration, common language,racism and fundamentalism are all explored in this appealing and engaging comic book developed from story ideas created by a group of young people honestly expressing how they view their rapidly changing world. "It was good to openly discuss racist comments that we hear in the playground but wouldn't normally say in class, as it led to a better understanding of why they were wrong", said one student.